I have been president of the Association of Personal Injury Lawyers (APIL) for 100 days. It’s a good time to reflect on what I feel APIL has achieved so far since I took over the reins in April this year, and how very much more there is to do. It has been a hugely enjoyable and absorbing roller coaster of a ride so far. For those who don’t know APIL was founded 25 years ago, and the vast majority of its members are solicitors representing claimants in all sorts of personal injury claims, in England and Wales, Scotland and Northern Ireland. We also count barristers, other lawyers, academics and experts among our number. Our membership numbers around 3,500 and our members represent thousands of injured people every year. 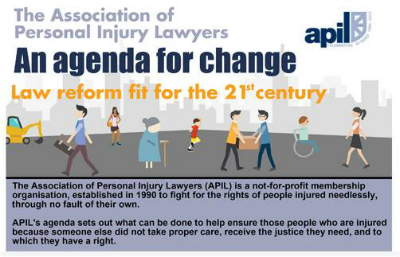 APIL is a not for profit organisation and primarily exists to represent the interests of injured people. To that end, APIL is the leading provider of training to personal injury lawyers, and we run accreditation schemes to ensure our lawyers are the best they can be when it comes to representing their clients. We engage with Government at all levels, putting the case for injured people to every policy position. The aims of the organisation are to promote full and just compensation for all types of personal injury, to promote and develop expertise in the practice of personal injury law, to promote wider redress for personal injury in the legal system, to campaign for improvements in personal injury law, to promote safety and alert the public to hazards wherever they arise and to provide a communication network for members. So 100 days in, how have I found it? No day is the same (well this goes for my day job too) and I have had the chance to meet people and do things that my day job would never have allowed. A lot of APIL’s work involves political lobbying and standing up for injured people in the press. I have now had a lot of experience speaking to journalists of the legal press, and my Mum certainly would have been proud of the in-depth cover story in the August Solicitor’s Journal (first published in 1856) on the 23 June, which was all about me! . The fact that that was referenced by a picture of a silhouette of a ghost child with scary hands was rather disturbing perhaps, although no doubt designed to reflect my practice in representing survivors of child abuse. I have also spoken to the national media and readers of the Sunday Telegraph may have seen my comment on the Government’s plans to fix fees in clinical negligence claims. Daily Express readers would also have been treated to my views on the “compensation culture”, a hardy perennial of a topic which needs rebutting at every turn. Much of the role is to engage with members, be visible, and listen to their ideas. I have given speeches, and chaired a number of conferences and meetings from Brighton to Leeds – the geographical spread is the whole of the UK. I will be going to Scotland before long too – now that’s as exotic as it gets! Webinars are also a popular way of speaking to a large number of people and I take part in a quarterly programme designed to inform and entertain. We have also pioneered an “ask the president” twitter event which attracted some interest on the social media site and we will build on that. Lawyers are perhaps such late adopters of new ways of engagement but it’s important we keep things up to date to appeal to our wide cross section of membership. It occurs to me that many of our newest members were probably only just born when I qualified as a solicitor. But I am not going to dwell too much on that! The president is also the chair of executive committee meetings when our learned elected committee debate policy and strategy. Deborah Evans our CEO is working on a gender diversity strategy and governance review since my election in April. There has been lots of work too in telephone conferences, Skype calls and face to face meetings thrashing out policy on any number of reforms the Government are throwing at us, and responding to consultations. I am involved too on our training committee and the editorial board of our academic tome the Journal of Personal Injury Law. It’s amazing just how much work goes in to making APIL tick! Since April our public affairs team has developed a new campaign agenda document as a way to engage with politicians and opinion formers throughout the personal injury sector. This has been doubly important this year since the general election with new ministers in place. I have personally met with Lord Faulks, the civil justice minister, to help put across our agenda for change, as well as the incoming chief executive of the Law Society, Catherine Dixon. Her majesty Queen Elizabeth also graciously invited me to one of her garden parties in May. It was a lovely day, and whilst I didn’t have the chance to chat to her about APIL’s agenda, I did enjoy her cucumber sandwiches! Co-operation and collaboration is of a good way of taking the sting out of the tail of litigation. Work is being undertaken on a re-working of the Rehabilitation Code, and a best practice guide to dealing with serious injuries is nearing completion. Pre-approved mediators by both sides may also speed up the litigation process and give a fair result without having to go to court: Good news for our clients and indeed everyone involved in the system. All these initiatives are designed to ensure that injured people get the treatment they need to get back on their feet at the earliest opportunity, that their needs are properly assessed and recognised, and interim payments are forthcoming to help. 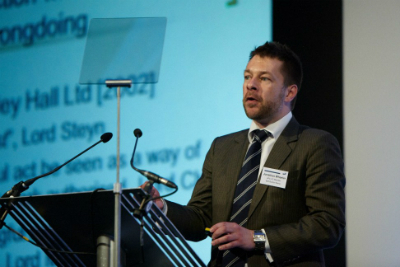 Whilst in my second blog I give some insight into APIL’s positive agenda going forward, inevitably we have to react to others’ agendas too – by which I mean the insurance industry and the Government. I think much good work has been done collaboratively on the Government’s Insurance Fraud Taskforce and I have been involved in shaping the response to fraud in personal injury claims. Over the not too distant horizon fixing fees for hearing loss and medical negligence claims needs to be tackled. I do not have a problem with fixing fees per se, but you have to fix the process first and any recommendations need to be based on solid evidence. Otherwise (as has happened before) solicitors can’t afford to operate in the system, clients go unrepresented and we know that the majority would not pursue their genuine claims. So access to justice suffers and society as a whole is short-changed if the polluter doesn’t pay. There is always a big picture consequence to tinkering around with our civil justice system and APIL is one organisation that can ensure that bigger picture isn’t missed. Above all I want to promote accreditation and training among our members. APIL is the leading training provider in our industry and we have won plaudits from independent bodies who hail our accreditation scheme to be among the best in the business. We need to prepare our members for the challenges of tomorrow and make sure that they are the best lawyers they can be today. This is why I am so committed to APIL and why it continues to have a place to support its members, and champion the rights of injured people in an age of austerity and change.